5:37 Will a new class ever be added to Hearthstone? 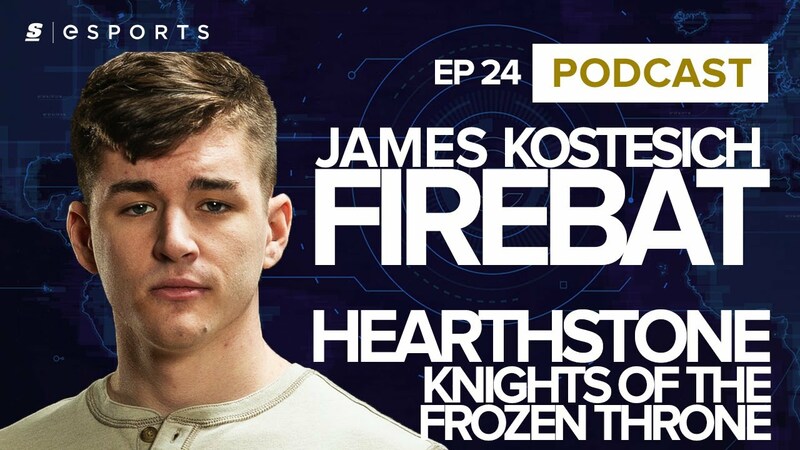 With Hearthstone's newest expansion officially set for a mid-August release, theScore esports Podcast sat down with James "Firebat" Kostesich over Skype to talk about Knights of the Frozen Throne, the future of Hearthstone as an esport and why his fellow players need to stop complaining about RNG so much. While details on the new set are scarce, Hearthstone's latest expansion will feature Death Knight-inspired cards and mechanics, including the ability to turn each of the game's nine classes into Death Knights themselves. Though only a few cards and mechanics have been revealed so far, Firebat told theScore esports Podcast that he's looking forward to the changes the expansion will bring to the game. "I think it's really cool that we're transforming heroes," Firebat said. "I think Jaraxxus is one of the most liked cards of all time in Hearthstone. It's cool that now it seems that everyone's getting their own Death Knight variation where they transform their hero. So every class now gets Jaraxxus, not just Warlock. So I'm not sure on the competitive reality of that, because we don't have enough information, but from an aesthetic point and from a unique ways to play the game point of view, it's amazing." But as for the first revealed Hero Card, Deathstalker Rexxar, Firebat has some harsh words for the now undead hunter. "It looks awful," he joked. "To be totally honest, I don't think that's seeing too much competitive play." In the lead up to the announcement, many Hearthstone fans speculated that this would be a prime opportunity for Blizzard to add a 10th class to the game, which is currently lacking the Death Knight, Monk and Demon Hunter classes from World of Warcraft. Firebat is not optimistic that any additional classes will ever be released, as the changes that Blizzard would need to make to Hearthstone in order for a new class to function properly would not be worth the effort. "I don't think we're ever going to get one," he said. "They would have to rework so many different things because currently all of the cards and all of the classes are balanced in such a way to interact with each other. So adding another piece to that puzzle makes it crazy more complicated to re-balance everything and they'd have to rework cards and deal with all of that. They'd have to change the interface around in certain areas because it's all just set up for this. Even things like the previous solo adventures would have to be reworked, and it seems like a lot of effort for the amount they'd get out of it when they could just add new cards." It's no secret that Hearthstone utilizes RNG in a way that has produced some infamous card mechanics and crazy interactions, so much so that some professional Hearthstone players frequently complain about RNG after they lose a match. For Firebat, complaints like those are detrimental to the scene. "I think that the public conduct of the players really hurts the scene," Firebat said. "I think a lot of players just don't get it. They just don't get that there's something bigger going on here. It's not just them and the one time that they get unlucky, or them and they need to make excuses so they can't say 'Oh that guy just beat me.' No one says that. Everyone always has to make some excuse for why they lost cause they don't want to feel bad. "The perception of the game affects their ability to make money playing the game," Firebat continued. "It affects their ability to make money off of their content, it affects everything about them if they want to do this full time. If they want to be a professional player, which a lot of them are on orgs and they're committed to trying to become a professional player, they do this full time, they stream every single day. The image of the game affects your livelihood. And if you're too ashamed to man up to the fact that you got beat and you make excuses and blame the game for your loss instead of blaming yourself, one, you're not going to get better. So already you're hurting yourself there. And two, people are going to look at the game less positively and they're going to want to watch the game less and watch you less because you have a negative attitude. It just hurts everyone involved." Going forward, Firebat said he is interested in trying as many different options as he possibly can to continue his Hearthstone career. Whether it's streaming, organizing tournaments or playing Hearthstone professionally, Firebat said that he prefers to keep his options open, as full-time streaming is not appealing following a previous experience. "I don't want to pigeonhole myself into doing only one thing," Firebat said. "I've done the whole streamer route before, that would be the way that I make the most money with my time. But after about a month of streaming every day for four or five hours, I wanted to blow my brains out. I love the game, but I can't do sitting at my desk all day every day doing the exact same thing. So, it drives me nuts to do that. I want to be able to have a little bit more freedom with what I do and try a bunch of things."